FILE - Venezuela's chief prosecutor Luisa Ortega Diaz talks to the media during a news conference in Caracas, Venezuela, May 24, 2017. Venezuela's Supreme Court has frozen the assets of its attorney general and barred her from leaving the country because of alleged "serious misconduct" in office. A public hearing for Luisa Ortega Díaz has been set for Tuesday morning. Wednesday's decision by the court — stocked with appointees of embattled President Nicolas Maduro and his predecessor, Hugo Chavez — came at the request of National Assembly lawmaker Pedro Carreño. Ortega, a Chavez protege, has distanced herself from the current government. At a news conference hours earlier, Luisa Ortega said her country is facing "state terrorism" and promised to "defend the constitution and democracy even with my life, I swear." "What I think is that we have a state terrorism, where the right to protest is lost, where demonstrations are cruelly repressed, where civilians are tried in military" court, Ortega said, calling for restored constitutional order. She also declared herself an enemy of Maduro's government. FILE - Venezuela's President Nicolas Maduro, left, speaks during a gathering in support of him and his proposal for the National Constituent Assembly in Caracas, Venezuela, June 27, 2017. Maduro and the ruling Socialist Party have called her a "traitor" since March, when she denounced the Supreme Court's efforts to wrest legislative powers from the opposition-led National Assembly. Ortega did not refer to the unusual incident Tuesday in which a police helicopter buzzed the Supreme Court and Interior Ministry buildings. 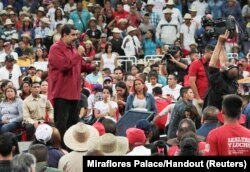 Maduro labeled the helicopter incident a "terrorist attack" and coup attempt. His political rivals and others have questioned its authenticity, suggesting it might have been staged to give the president an excuse to take even tougher positions against protesters. Ernesto Villegas, communications minister, said the incident would not impede the socialist government's plans for a July 30 constituent assembly to redraw the constitution. During three months of near daily anti-government protests, at least 79 people have died in clashes among Maduro's foes, fans and security forces, according to the prosecutor's office. On Friday, the U.N. Special Rapporteur on judicial independence issued a statement challenging the Venezuelan court’s moves against Ortega.